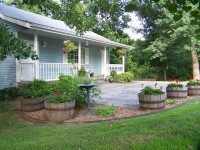 Relax and Romance at our secluded luxury bed and breakfast located on 10 wooded acres. Enjoy private cottages and king jacuzzi suites with a full breakfast and evening desserts in your room. All accommodations include a long list of preferred amenities. Weddings Performed and Packages Available. Mountain Water Cabin is tucked in the woods just outside Rogers. It is a cozy, country two-person cabin with lake view and lake access overlooking the Monte Ne (meaning "Mountain Water") branch of Beaver Lake. Views are beautiful year round. Full country breakfast is served. The Lodge At Elm Springs is a new Bed and Breakfast opened in 2018. With five bedrooms, four bathrooms, three living areas, and a large wrap-around porch, The Lodge invites you to make yourself at home. Amenities of each room include: complimentary water, coffee and tea bar, luggage rack, USB charging station, iron, ironing board, hair dryer, extra pillows, blankets, and a Marpac Dohm Elite White Noise machine. Bathrooms are stocked with shampoo, conditioner, and body wash.
Repair your senses; escape a world away to our Queen Anne-style Victorian mansion in Eureka Springs. Nestled on a wooded hillside in the Historic District, our luxury Inn offers peaceful views of the hills and beautiful gardens from its large, wrap-around veranda.